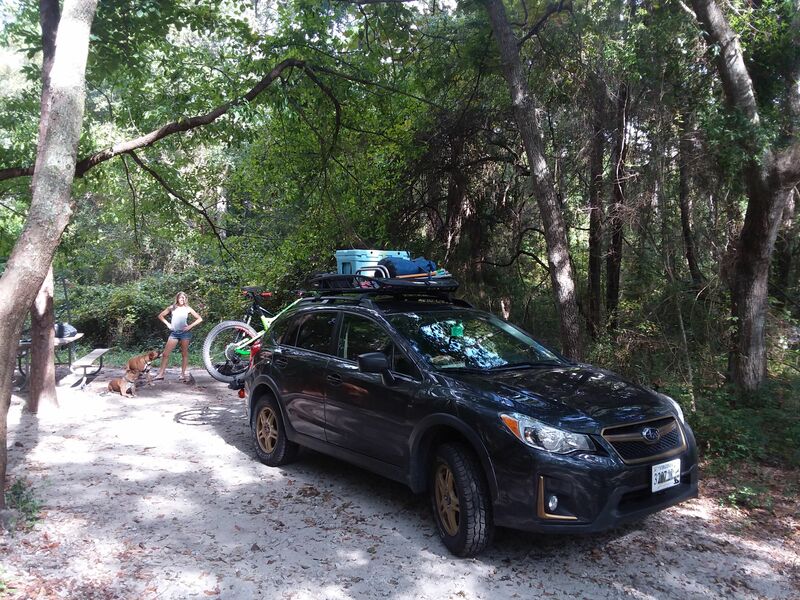 I'm beginning to think that the Crosstrek might not be perfectly suited for SOME types of off-roading. With no ability to enter 4LO and a manual transmission instead of an automatic, it certainly doesn't like to putt along at a slow pace. This characteristic isn't much of an issue when I'm able to drive 10mph or greater, but when stuck behind other vehicles (e.g. Trucks in 4LO), the Crosstrek bogs down and is forced to slide the clutch, which will eventually result in a completely burnt clutch, leaving us stranded. 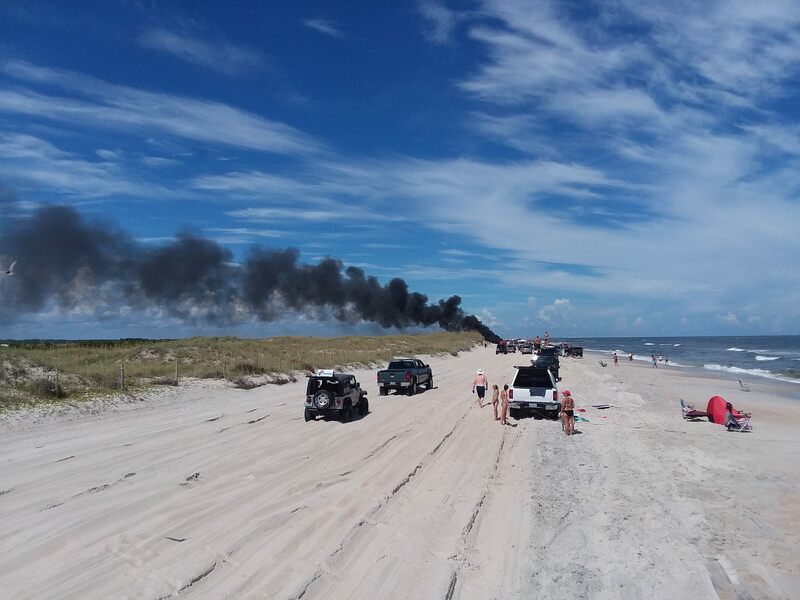 When we approached the entrance to the park, there was a long line of trucks waiting for their turn to drive on the beach. 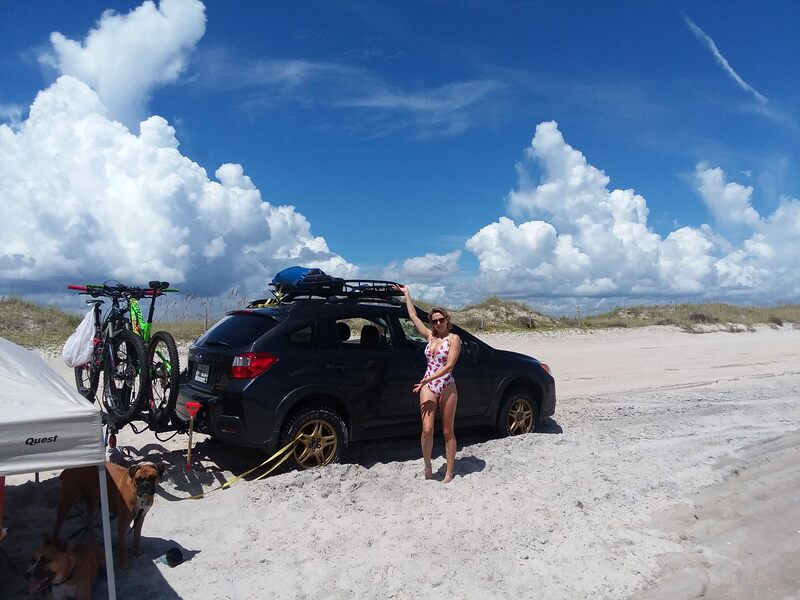 There were several park officials there, collecting entrance fees and lending advice to those unfamiliar with driving in the sand. One of the officials gave a doubtful glance at the Crosstrek and asked "is it four-wheel-drive, or all-wheel-drive?" To that, I answered simply that it had been on the beach before (even if not THIS beach). 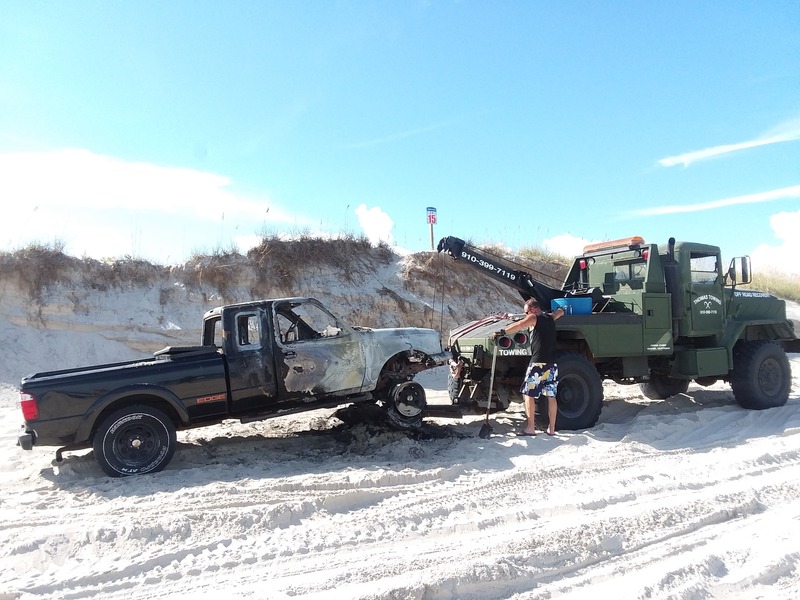 Past her, we were met with the final official - a local police officer directing the extraction of several vehicles that had been buried axle-deep in the soft sand. He too had to give the Crosstrek a second look, but kept his comments to himself and agreed with me when I told him I'd just have to "give her hell!" I let the vehicle ahead of us get a healthy head-start, then I pounded the gas pedal and took off in first gear. Surprisingly, the Crosstrek plowed through the deep ruts [with no low-hanging center differential]. As we quickly caught up to the crowd of trucks ahead. I tried my best to get around some of them, but eventually we were forced to slow, bogging down in the deep sand and coming to an eventual stop. I was nervous that we'd be stuck there for the remainder, but decided to air down a touch further and try my best to give it the old "back-and-forth" - and it worked! The main issue came every time I had to slow for another truck. In order to mitigate the slow speed, our poor clutch had to allow some slippage, emitting the foul smell of a burning clutch. I tried my best to keep this to a minimum, but just had to let it eat itself alive from time to time. With that said, we were still able to make our way down Freeman Park in the midst of a sea of stuck trucks - all the while confident that we were the ONLY car out in the sand that day! Our luck was far better that one fellow wheeler whose Ford Ranger caught fire and practically burnt to the ground. Rebecca and I felt terribly sorry for the guy, hoping that he at least had comprehensive insurance coverage to help lessen the agony of this terrible mishap. On our way out, I again tried to baby the clutch as best as possible. Luckily, the engine can operate at a relatively low rpm (somewhere around 1200 or above), but all the while I just wished I could skate around the slow trucks causing the Crosstrek to wallow in misery.